An article by Steven Goff for The Washington Post. Whenever I tell people I am going to Jamaica on assignment, the reaction is the same: Nice gig, must be tough, hope you sunburn. My purpose is not vacation, however, and the destination is definitely not Negril. There are no all-inclusives on Kingston’s waterfront. This is a tough, gritty, port city at the base of the Blue Mountains, rich with history but not a tourist destination — aside from those paying homage to Bob Marley at the reggae legend’s former residence, now a well-curated museum, at 56 Hope Road. Immaculate beaches and pretty drinks? Other side of the island, mon. Today’s trip begins at a charter office at Washington Dulles, where I meet the U.S. team for a three-hour flight. I usually fly commercial in order to set my own timetable and avoid the awkwardness of non-official interaction with players and coaches. But the USSF has extra seats available and the fee is comparable to flying commercial. What is not comparable are security bottlenecks, crowded terminals and long lines at Starbucks when traveling among the masses. The other reason for flying with the team is the next leg of the trip: Kingston to Seattle ahead of next Tuesday’s qualifier against Panama. There are longer commutes in CONCACAF – Port of Spain to Vancouver, anyone? 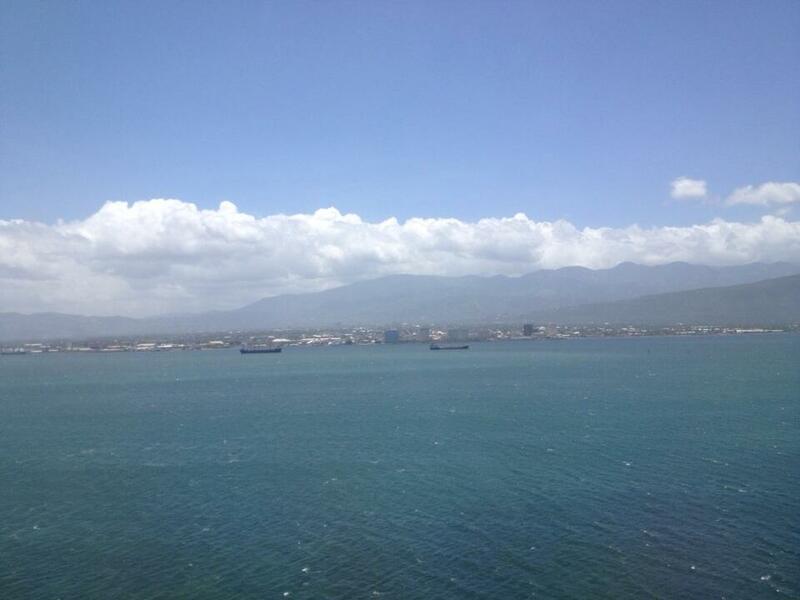 – but the Caribbean to Puget Sound involves multiple airports and many hours. The charter requires a refueling stop only. Indeed, the Caribbean countries are not as feverish about their football as their Central American counterparts. They love the game; they just don’t live and die by it. Win, lose or draw, soccer is a celebration on the islands. Fans in Mexico City and San Jose are not as accepting of defeat, particularly on home ground. I took the team charter a few times when Bruce Arena was coaching. The practice of allowing reporters to tag along abruptly ended after one scribe missed the most important deadline – the one requiring him to re-board the bus heading to the airport immediately after a match. While the convoy waited for him, Arena fidgeted and fumed. There is nothing very interesting about these team flights. Most seats on today’s trip were standard coach, but the plane is not full and everyone spreads out. Players stay together in one section. Coaches are in another. Riff-raff media is in with the support staff. Meals are plentiful but not fancy. Snacks and drinks are available at any time. The in-flight magazine, published in Miami, is dedicated to Cuban tourism and culture. One feature is titled “El Dinosaurio Y El Sofa,” an odd analogy exploring the rise in popularity of international soccer (the Dinosaur consumes everything) and the decline of the domestic baseball league (throwing out an old couch) in Cuba. Cuba, for me, is a wonderful and distant memory. The U.S. team played there in 2008. I’m glad I was able to visit and explore while it remains a restricted land to Americans. Stories for another day. In Kingston, I hope to reconnect with a taxi driver known only as “Indian.” (His family immigrated to Jamaica from India.) Last fall, I relied on him for transportation and city guidance. To show my appreciation (beyond the fare and tip), I bought him lunch at Usain Bolt’s sports bar: Tracks & Records. Second-best Caribbean taxi adventure: Late-night arrival in Trinidad. Four of us squeezed into Shahadeen’s small vehicle. Carnival has consumed Port of Spain, so the only available rooms were 20 miles north at a yacht club. The dark road hugged the sea, stationary ships twinkling offshore. Without warning, the driver pulled off in front of a dimly lit roadhouse and dashed off without explanation. Surely, the naïve Americans were going to have to hand over their wallets and laptops. Five minutes passed. Silence. Shahadeen scampered back, his arms pressed against his torso. He managed to open his door, reached in … and handed us open bottles of Carib beer. “Drink, my friends!” he commanded. Transportation today from the airport to the cluster of business hotels in New Kingston was uneventful…until I arrived at the Wyndham. Odd, where are all the cars and taxis? And why is the lobby dark? “But I have had a reservation since March,” I reply. With Mexico and its supporters and media in town for tonight’s qualifier against the Reggae Boyz, all decent hotels are booked. Thanks to ace photographer John Todd, I have shelter. (Plenty of rooms will open up tomorrow.) This is life on Planet Futbol. In each of my previous voyages to Jamaica, I have broken from the work routine for a few hours to take the Marley museum tour. Five is enough and I’ll probably skip it this time. With each visit, though, something new is revealed about the musical and cultural icon. I am not Rastafarian, nor religious, but after two hours on the grounds, I am awash in spirituality and reflection. The last time I stopped by, the gift shop offered the ideal crossover keepsake: a Marley soccer ball in Jamaican colors: gold, green and black. One love. The journey continues…..